This brand may seem unfamiliar for some of you, so let me introduce you to this local product cosmetic named ZIA . ZIA Skincare is a local product based in Mojokerto, East Java which known as their natural skincare, but these days they also released their makeup collection, including this soft matte lipstick. I got this two shades from previous event Surabaya Beauty Blogger 's 2nd Soiree as goodie bag and I am just too excited to give you my experience using these two products, so let's just heading to the review ! This pigmented lipstick has a soft and creamy texture with slightly sheen matte finish, but not drying to your lips because ZIA Soft Matte Lipstick contains Rice Bran Wax. In fact, this lipstick is rich in Vitamin E that can penetrate in your skin layers to nourish your lips from within. Aside from that, it can even retain the moisture of your lips, boost the regeneration process, nourishes your skin cell so your lips will look fuller and smoother. This lipstick may not be fully transfer-proof but it stains your lips, so you don't have to worry about your lips during your activities. Super cute, elegant yet simple baby pink tube with hot printed silver wreath. It comes with sturdy paper box and safely sealed with label and plastic. Solid yet a little bit rough at the surface. It doesn't smell anything and the color is very pigmented. This lipstick's texture is quite solid rather than other lipstick I've tried before so it makes me worry if it could dry my lips - but in fact, it doesn't dry my lips at all ! The color is very pretty and pigmented, I only need one glide to cover whole lips. Unfortunately, just like it claims, this lipstick only lasts for 2 hours plus without eating or drinking and very transfer-able, so I have to retouch if needed. 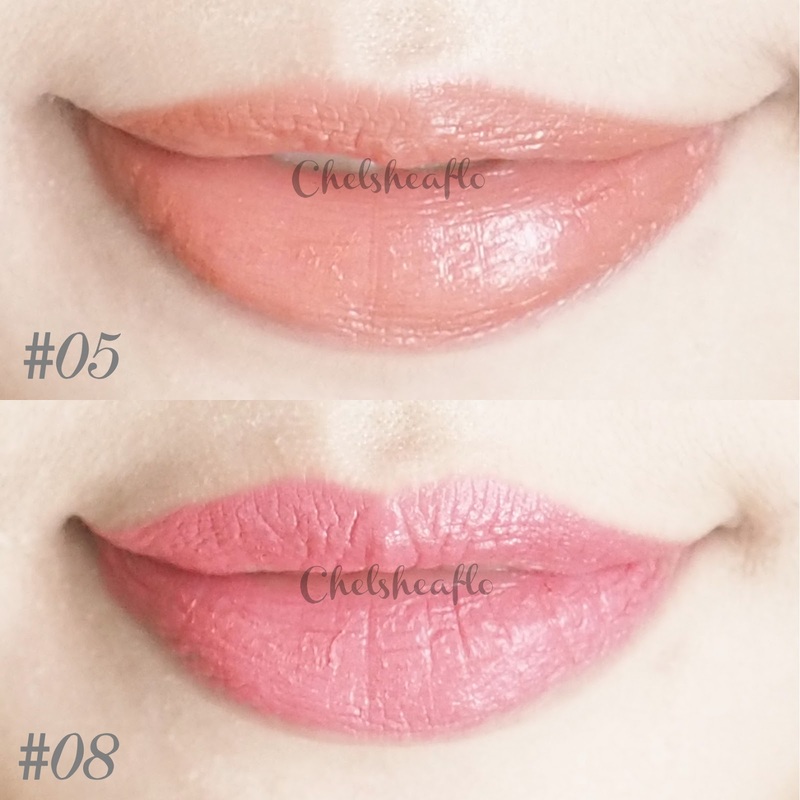 Oh, and one more thing, it leaves some flakes if I don't wear lip balm before ( as you can see on the picture above : #08 is without lip balm while #05 is with lip balm ). I must say that the reason why I like this product is because of the fancy packaging and the color variation. These two colors fit my skin tones very well and I think other colors are also pretty. So sad to know that it has low durability and very transfer-able. However, I still recommend you this lipstick if you have yellow/warm skin tone just like me because almost all of the colors are perfect for warm skin tone.